Background: Increased oxidative stress is a widely accepted contributor to the development and progression of diabetes mellitus (DM). A lot of work is being done to unravel the mechanisms linking oxidative stress with diabetes and its complications. Objective: The objective was to investigate the relationship between blood glucose levels, glycated haemoglobin and three markers of oxidative stress in DM: catalase (CAT), superoxide dismutase (SOD) and glutathione transferase (GST). Methods: Subjects were consecutive patients with Type 2 DM receiving treatment and apparently healthy controls. Fasting blood glucose, HbA1c, CAT, SOD and GST were assayed in the diabetic subjects and controls using standard procedures. Information on the presence of neuropathy and nephropathy was obtained from case notes, whereas screening for retinopathy was carried out at the Ophthalmology Unit of Obafemi Awolowo University Teaching Hospitals Complex. Data were analysed using Statistical Package for the Social Sciences for Windows, version 17. Results: A total of 115 subjects comprising 65 diabetics and 50 controls were studied. Mean fasting blood glucose, CAT, SOD and GST activities in test and control subjects were 9.12 (0.48) and 4.78 (0.63) mmol/L, 48.20 (2.69) and 63.22 (1.83) units/mg, 53.22 (2.44) and 62.55 (2.68) units/mg and 1.35 (0.09) and 3.47 (0.11) units/mg, respectively. Statistically significant differences were observed when levels of fasting blood sugar, CAT, SOD and GST were compared between diabetic and non-diabetic subjects. Diabetic subjects with one or more microvascular complications were found with significantly higher HbA1c levels than those without apparent complication. There was significant negative correlation between fasting blood glucose and all three antioxidant enzymes. Conclusion: The results of the present study suggested that fasting blood sugar modulated levels of antioxidant enzymes while protein glycation plays a role in the development of microvascular complications. Oxidative stress is a pathological condition resulting from either increased production of free radicals or decreased level of antioxidants. High levels of free radicals damage cellular proteins, membrane lipids and nucleic acids and lead to cell death. DM is usually accompanied by increased production of free radicals or impaired antioxidant defences. Sources of free radicals in DM include glucose oxidation,  lipid peroxidation  and the interaction of glucose with proteins leading to the formation of advanced glycation end products. These products inactivate enzymes and alter their structures and functions, promote free radical formation and quench antiproliferative pathways. While on the one hand, hyperglycaemia engenders free radicals, on the other hand, it also impairs the endogenous antioxidant defence systems in many ways. The enzymes superoxide dismutase (SOD), catalase (CAT), glutathione (GSH) peroxidase and GSH reductase play very crucial roles in the detoxification of free radicals and are regarded as biomarkers of oxidative stress. Alterations in the levels of these enzymes may lead to ineffective scavenging of free radicals in the body. Several authors have reported a link between these biomarkers of oxidative stress and the occurrence of diabetes though most of the findings do not agree. ,, In addition, many studies have reported that some antioxidant vitamins have glucose-lowering effects, , but to the best of our knowledge, none has provided information about a direct link between blood glucose levels, glycated haemoglobin (Hb1c) and antioxidant enzyme levels. The aim of the present study was therefore to investigate the relationship between fasting blood sugar, Hb1c and three biomarkers of oxidative stress: CAT, SOD and glutathione transferase (GST) in diabetic patients and controls in Ile-Ife, thus contributing to knowledge on the relationship between hyperglycaemia and oxidative stress and ultimately providing information which may assist in better management of patients with Type 2 DM. The study population consisted of patients with Type 2 DM receiving treatment at the Obafemi Awolowo University Teaching Hospitals Complex (OAUTHC), Ile-Ife. Sample size was calculated using a prevalence of 3.9%, an error margin of 0.05 and 95% confidence level. The control subjects were members of staff of Obafemi Awolowo University. Ethical approval was obtained from the Ethical Committee of the OAUTHC, and informed consent form was signed by each participant. Control subjects were screened for diabetes using Accu-chek Active glucometers. Subjects with fasting blood glucose above 100 mg/dl were excluded from the study. Other exclusion criteria included pregnant women and subjects who had one form of illness or the other at the time of the study. Structured questionnaires were administered to the patients and controls to obtain information on demographic parameters as well as drug and medical histories of the participants. Information about the presence of neuropathy and nephropathy in the patients was obtained from the case notes while the subjects were screened for retinopathy at the Ophthalmology Unit of OAUTHC. A fasting venous blood sample was collected from each subject into heparinised tubes for enzyme assay and fluoride oxalate tubes for glucose assay. Erythrocytes were separated by centrifugation at 4000 rpm for 20 min at 4°C. The erythrocytes were washed three times with a buffer solution containing 250 mM Tris hydroxyl methylaminomethane-HCl Tris Hcl pH 7.4, 140 mM NaCl, 1 mM MgCl 2 , 10 mM glucose and re-centrifuged at 4000 rpm. The erythrocytes were resuspended in the buffer and lysed by freezing and thawing, , and the haemosylate was diluted with 40 volumes of 0.1M Tris-HCl buffer pH 7.4 and centrifuged at 13500 rpm for 30 min. The supernatant was removed and kept at −80°C before analysis. Fasting blood glucose level was determined using Randox glucose kits, based on the method of Barham and Trinder. In this method, glucose is oxidised by glucose oxidase to produce gluconate and hydrogen peroxide. The hydrogen peroxide is oxidatively coupled with 4-aminoantipyrene and phenol in the presence of peroxidase to yield a red quinone-amine dye which is measured at 505 nm. Hb1c was measured using clover A1C kits. Protein concentration was determined using the Bradford method  in which the dye, Coomassie brilliant blue forms a complex with proteins in solution, which is the maximally absorbed at 595 nm. SOD activity was measured based on the ability of the enzyme to inhibit auto-oxidation of epinephrine at alkaline pH. Superoxide anion generated by the xanthine oxidase reaction causes oxidation of epinephrine to an adrenochrome which can be monitored at 480 nm. One unit of SOD was expressed as the amount of the enzyme needed to cause 50% inhibition of adrenaline oxidation. CAT activity was determined by measuring the rate of decomposition of hydrogen peroxide at 240 nm. Activity of GST was determined as described by Habig et al. This is a spectrophotometric method based on the conjugation of 1-chloro-2,4-dinitrobenzene (CDNB) with reduced GSH to form CDNB-S-GSH complex. GST activity is the amount of the complex formed, which is monitored spectrophotometrically at 340 nm. Specific activities of each of the 3 enzymes were calculated for patients and controls by dividing the activities by the protein concentration. Data were analysed using Statistical Package for Social Sciences (SPSS), IBM Inc, New York for Windows version 17. Mean values were compared using Student's t-test and ANOVA. Pearson's correlation coefficient (r) and regression analyses were used to ascertain the relationship among continuous variables. Statistically significant level was P < 0.05. A total of 65 Type 2 diabetic patients and 50 apparently healthy controls were studied. Mean age of diabetic patients was 61.0 (2.15) years, whereas that of controls was 60.0 (1.81) years (the difference was not statistically significant). Mean fasting glucose, erythrocyte CAT, SOD and GST activities patients and controls were 9.12 (0.48) and 4.78 (0.63) mmol/L (P = 0.000); 48.20 (2.69) and 63.22 (1.83) units/mg (P = 0.000); 53.22 (2.44) and 62.55 (2.68) units/mg (P = 0.012); and 1.35 (0.09) and 3.47 (0.11) units/mg (P = 0.000), respectively. A total of thirty patients had one or more of retinopathy, neuropathy and nephropathy. [Table 1] compares the levels of biochemical parameters between the diabetic patients and controls. The diabetic patients had statistically significantly lower levels of all three antioxidant enzymes compared with the controls, whereas fasting blood glucose was statistically significantly higher in the diabetic patients. [Table 2] shows the results of correlations between fasting blood sugar, Hb1c and the antioxidant enzymes. There was a significant negative correlation between fasting blood glucose levels and the antioxidant enzymes. [Table 3] shows the linear regression analysis of fasting blood glucose levels against the levels of the enzymes; showing how fasting blood glucose predicted antioxidant enzymes. Fasting blood glucose levels were inversely related to the levels of the enzymes. [Table 4] compares the levels of biochemical parameters between patients with and without microvascular complications. Thirty patients had one or more of diabetic nephropathy, neuropathy and retinopathy. Patients with microvascular complications had statistically significantly higher Hb1c levels and lower GST levels than patients without complications. Increasing evidence suggests that oxidative stress plays a major role in the pathogenesis of Type 2 DM. It is however not clear whether increased oxidative stress is a cause of Type 2 DM or a consequence of disease progression. In the present study, in addition to the fact that diabetic patients had significantly lower levels of the three antioxidant enzymes, significant negative correlation was found between fasting blood glucose on the one hand and the levels of the enzymes on the other hand. Regression analyses also showed that high fasting blood glucose levels were significantly associated with low levels of each of the three enzymes shown by negative Pearson's correlation coefficient. It is however noted that there was no significant difference in mean levels of these enzymes when diabetic patients who were recently diagnosed with the disease and were yet to show signs of microvascular complications were compared with those who had one or more of such complications. This would suggest that the low levels of the enzymes found in the diabetic patients were related more to manifestation of diabetes itself than its progression, evidenced by the development of complications. 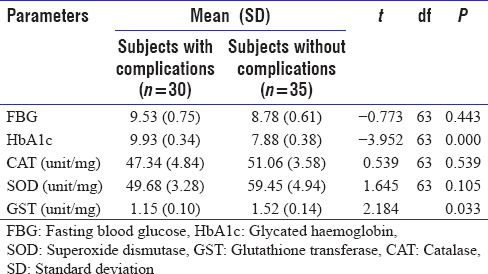 The significantly higher Hb1C levels found in the diabetic patients with complications further buttressed the role of advanced glycation end products in the development of diabetic complications. Glycaemic control is therefore crucial to the prevention of complications of DM. It has been suggested that oxidative stress acts on signal transduction and via nF-kB affects gene expression, thereby reducing the expression of antioxidant enzymes. Another possibility is that hyperglycaemia inactivates existing enzymes by glycating these proteins. Both postulations suggest that oxidative stress may develop due to insufficient antioxidant activities. However, Hb1c levels did not have a significant correlation with any of the enzymes studied, thus making it unlikely that their levels were reduced as a result of glycation. Considering the limited sample size in the present study, further studies are desirable, using a larger sample size with adequate representation of diabetic patients at various stages of the disease. Another limitation of the study was the fact that information about the presence of microvascular complications, with the exception of retinopathy was extracted from case histories of the patients and not through biochemical assays or direct observation. While the present study showed the significant negative relationship between fasting blood glucose levels and the studied markers of oxidative stress, there is a need for better understanding of the mechanisms involved and how this affects the prognosis and outcome of Type 2 DM. In addition, it is suggested that drugs capable of upregulating the synthesis of these enzymes may prove useful as therapeutic agents for the management of diabetes and its complications. International Diabetes Federation. Atlas. 6 th ed. Brussels, Belgium: International Diabetes Federation; 2013. Available from: http://www.diabetesatlas.org. [Last accessed 2015 May]. Wikipedia: Epidemiology of Diabetes Mellitus. Available from: http://www.en.wikipedia.org/wiki/Epidemiology_of_diabetes_mellitus. [Last accessed 2015 May]. International Diabetes Federation. Available from: http://www.idf.org/membership/afr/nigeria. [Last accessed 2015 May]. Halliwell B, Gutteridge JM. Role of free radicals and catalytic metal ions in human disease: An overview. Methods Enzymol 1990;186:1-85. Jiang ZY, Woollard AC, Wolff SP. Hydrogen peroxide production during experimental protein glycation. FEBS Lett 1990;268:69-71. Tsai EC, Hirsch IB, Brunzell JD, Chait A. Reduced plasma peroxyl radical trapping capacity and increased susceptibility of LDL to oxidation in poorly controlled IDDM. Diabetes 1994;43:1010-4. Hori O, Yan SD, Ogawa S, Kuwabara K, Matsumoto M, Stern D, et al. The receptor for advanced glycation end-products has a central role in mediating the effects of advanced glycation end-products on the development of vascular disease in diabetes mellitus. Nephrol Dial Transplant 1996;11 Suppl 5:13-6. Vlassara H. Recent progress in advanced glycation end products and diabetic complications. Diabetes 1997;46 Suppl 2:S19-25. Saxena AK, Srivastava P, Kale RK, Baquer NZ. Impaired antioxidant status in diabetic rat liver. Effect of vanadate. Biochem Pharmacol 1993;45:539-42. Kaul N, Siveski-Iliskovic N, Thomas TP, Hill M, Khaper N, Singal PK. Probucol improves antioxidant activity and modulates development of diabetic cardiomyopathy. Nutrition 1995;11 5 Suppl: 551-4. Sailaja-Devi MM, Suresh Y, Das UN. Preservation of the antioxidant status in chemically-induced diabetes mellitus by melatonin. J Pineal Res 2000;29:108-15. Aragno M, Tamagno E, Gatto V, Brignardello E, Parola S, Danni O, et al. Dehydroepiandrosterone protects tissues of streptozotocin-treated rats against oxidative stress. Free Radic Biol Med 1999;26:1467-74. Olanlokun JO. Protective influence of Vitamin E on the antioxidant defence system in the whole blood and liver of normal and alloxan-induced diabetic rats. Indian J Clin Biochem 2008;23:62-6. Effiong GS, Mgbeje BI, Igile GO, Atanguho JI, Eyong EU, Ebong PE. Antioxidant enzyme activity and hormonal changes following administration of ethanolic leaf extracts of Nauclea latifolia and Gongronema latifolium in streptozotocin induced-diabetic rats. Eur J Med Plants 2013;3:297-309. Tsakiris S, Giannoulia-Karantana A, Simintzi I, Schulpis KH. The effect of aspartame metabolites on human erythrocyte membrane acetylcholinesterase activity. Pharmacol Res 2006;53:1-5. Galbraith DA, Watts DC. Changes in some cytoplasmic enzymes from red cells fractionated into age groups by centrifugation in Ficoll/Triosil gradients. Comparison of normal humans and patients with Duchenne muscular dystrophy. Biochem J 1980;191:63-70. Kamber E, Poyiagi A, Deliconstantinos G. Modifications in the activities of membrane-bound enzymes during in vivo ageing of human and rabbit erythrocytes. Comp Biochem Physiol B 1984;77:95-9. Barham D, Trinder P. Method for determination of blood glucose level by spectrophotometer. Analysts 1972;97:142-3. Aebi H, Bergmeyer HU. Methods of Enzymatic Analysis. Weinheim: Verlag Chemie; 1973; 87: 673-84. Habig WH, Pabst MJ, Jakoby WB. Glutathione S-transferases. The first enzymatic step in mercapturic acid formation. J Biol Chem 1974;249:7130-9. Morgan PE, Dean RT, Davies MJ. Inactivation of cellular enzymes by carbonyls and protein-bound glycation/glycoxidation products. Arch Biochem Biophys 2002;403:259-69. Wiernsperger NF. Oxidative stress as a therapeutic target in diabetes: Revisiting the controversy. Diabetes Metab 2003;29:579-85.